Reporting in Nature Materials this week, researchers from the London Centre for Nanotechnology and the Physics Department of Sapienza University of Rome have discovered a technique to 'draw' superconducting shapes using an X-ray beam. This ability to create and control tiny superconducting structures has implications for a completely new generation of electronic devices. Superconductivity is a special state where a material conducts electricity with no resistance, meaning absolutely zero energy is wasted. The research group has shown that they can manipulate regions of high temperature superconductivity, in a particular material which combines oxygen, copper and a heavier, 'rare earth' element called lanthanum. Illuminating with X-rays causes a small scale re-arrangement of the oxygen atoms in the material, resulting in high temperature superconductivity, of the type originally discovered for such materials 25 years ago by IBM scientists. The X-ray beam is then used like a pen to draw shapes in two dimensions. A well as being able to write superconductors with dimensions much smaller than the width of a human hair, the group is able to erase those structures by applying heat treatments. They now have the tools to write and erase with high precision, using just a few simple steps and without the chemicals ordinarily used in device fabrication. This ability to re-arrange the underlying structure of a material has wider applications to similar compounds containing metal atoms and oxygen, ranging from fuel cells to catalysts. Prof. Aeppli, Director of the London Centre for Nanotechnology and the UCL investigator on the project, said: "Our validation of a one-step, chemical-free technique to generate superconductors opens up exciting new possibilities for electronic devices, particularly in re-writing superconducting logic circuits. Of profound importance is the key to solving the notorious 'travelling salesman problem', which underlies many of the world's great computational challenges. We want to create computers on demand to solve this problem, with applications from genetics to logistics. A discovery like this means a paradigm shift in computing technology is one step closer." Prof Bianconi, the leader of the team from Sapienza, added: "It is amazing that in a few simple steps, we can now add superconducting 'intelligence' directly to a material consisting mainly of the common elements copper and oxygen." The X-ray experiments were performed at the Elettra (Trieste) synchrotron radiation facility. The work is published in Nature Materials , 21 August 2011 (doi:1038/nmat3088) and follows on from previous discovery of fractal-like structures in superconductors (doi:10.1038/nature09260). Image: In future, X-ray beams could be used to write superconducting circuits, such as those depicted in the image. 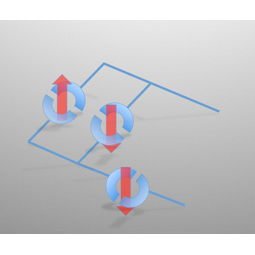 Here, solid lines indicate electrical connections while semicircles denote superconducting junctions, whose states are indicated by red arrows.